The city is buzzing ahead of the 2018 Boston Marathon on Monday, April 16. Marathon weekend is an electric time to be in the city as people travel from around the world to lace up their sneakers to participate in a Boston race. Since 26.2 miles on Monday isn't for everyone, though, the Boston Athletic Association holds the 5K event on Saturday. Dave McGillivray has been race director of the B.A.A. Boston Marathon for 31 years, but he also does the 5K, 10K, and half marathon. What makes these events such a draw? "It all comes down to the team. The B.A.A. has the most experienced team on the planet. We're very, very fortunate that that's our greatest asset, the experience of all the people that come together that pull something like this off." 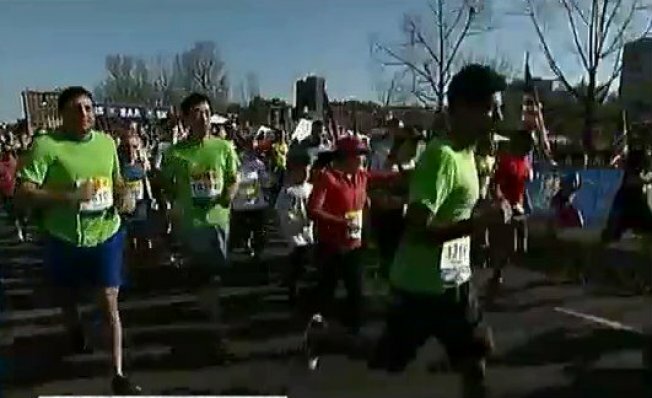 The forecast for the marathon on Monday is wet and windy, but Saturday had great weather. Which event is his favorite? “Of course, the Marathon is the crown jewel, the holy grail,” McGillivray said. “That's what runners from all over the world live for, is to come here to Boston to run on the same hallowed ground as the best runners in the world have done." McGillivray himself has run 144 marathons, including 45 Boston Marathons. "My main focus is the race itself and making sure the 30,000 get off on time and have a safe race. But then I've been doing it for a lot of years and always wanted to be an athlete myself so just sort of bring up the rear so I've been the last finisher for the last 30 years,” McGillivray said of his own efforts. “Philanthropy is a big part of this now. And I do my run for the benefit of the Martin Richard foundation, and there are a lot of other people out there who do it for a greater purpose, too, so all in all it's a great day." The B.A.A. 5K has been a tradition since 2009, and many feel it's a fantastic way to kick off the weekend. The race attracts people for different reasons. Bonnie and Myles McCormick travelled from Nova Scotia so they could say they ran Boston. "It's amazing to be in this city. We love this city," Bonnie said. "Boston is the runner's race. It's the best race that you can do. Even though we're only doing the 5K, we are thrilled to be here and be a part of this whole weekend," Bonnie said. “It's the mecca. It's the shrine of running. It's something you aspire to. It's something to be able to run, but it's a privilege to be able to come to Boston and to run a marathon, it's just bucket list. It's a dream. We love this city, the hospitality," Myles said. Some are running to crush goals, like Aiden Puffer who broke the 13-year-old record. Puffer said he's excited after putting in a lot of hard work. "I run about six days a week usually and cross train one day, and run about 45 miles a week." Puffer would like to finish the 5K in 13-flat someday. Puffer's dad said the winner of the 5K men's race gave his trophy to his son. Others are running to break boundaries like Tom Panek who is legally blind and ran with his guide dog Gus. Panek hopes others will get out and run with their dogs. Panek will run the Marathon on Monday, "but this was Gus's race," he said as he put the medal around his dog's neck. The B.A.A. 5K kicked off at 8 a.m., followed by the Invitational Mile at 10:30 a.m. and the Relay Challenge at 1 p.m.